In my scheme for categorizing Post-Apocalyptic rpgs, “Children of the Fire” games have a nebulous place. In these games, the catastrophe has happened recently enough that at least a few can recall the world before. But that event’s distant enough that a new order has arisen and some of the chaos has settled. Societal questions of survival have been answered, now it’s up to individuals to survive. So these games fall pretty close on the timeline to “Aftermath” games I mentioned before. But they also stand a step away from “Civilization in the Ruins” games. Another generation or two and they slip into the latter category. Two features define these settings. First, a strong recollection and longing for the previous world exists. Some first and second hand memory of that civilization still exists. That informs people’s hopes, fears, and despair. Not enough time has passed that the last world has completely passed into myth. They may have things desperately wrong and the new generation may have lost the culture and skills of the past. But some semblance of it echoes through the set up. Second, survivors still have access to decent relics of the past. Some machines and devices have been maintained, equipment has been kept up, the tech level has lowered but not collapsed. That connects to the first point- machines have not passed into legend. They’re not unknown artifacts to be enshrined. As well, the tech level has not jumped forwarded radically. It may have advanced, due to new mysterious circumstances, but those changes haven’t erased everything which came before. Examples of "Children of Fire" games from the list below include GURPS Reign of Steel, CORPS Apocalypse, and Deadlands: Hell on Earth. Games of this type from earlier lists include Wastelands, Bitume, After the Bomb, and Car Wars. To keep this list easy to read I’ve tightened the years covered. As we get closer to the present the lists expand and contract weirdly. I include mostly core books, but also significant setting or sourcebooks. I consolidate “spin-off” and miscellaneous supplements into a single entry. For example you may see at the end of this list isolated modules for a line using post-apocalyptic elements. Given the number of great things published I haven't included everything I want. I try to list revised editions which significantly change a line or present a milestone. Generally I only include published material- print or electronic. I skip freebie or self-published games. I'm sure I've left something off without adequate reason; feel free to add a comment about a line I missed (if published from 1994 to 1996). I've arranged these by year and then alphabetically within that year. If you'd like to support this project, please check out my Patreon page. I came late to seriously playing computer and video games. I only really put the hours in with the Playstation and I didn't buy a PC game until my 30's. At that time we had a couple of clunky machines. I remember desperately trying to get the sound card to work in the DOS prompt. Programs interacted weirdly with video set ups. That meant one out of four games just wouldn't work, but I still bought them. I plucked Dark Earth and its strategy guide off the EB Games discount rack. When I couldn't get it to run, I loaned it to my friend Barry. He loved the weird look of this game and spent hours on it until a catastrophic bug stopped his progress. In the end, I experienced Dark Earth second-hand through Barry's stories. 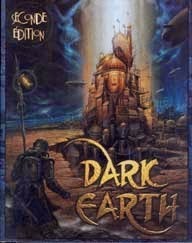 I recalled that this week when I discovered that Dark Earth had a tabletop rpg. I'd forgotten the computer game completely. Released in France, Dark Earth’s setting opens with a meteor strike igniting the Great Cataclysm. Survivors find themselves in a shadow world, with sunlight obscured by dust clouds. Then monsters of darkness begin attacking. Humanity flees to the few places where sunlight still hits. These refuges serve as the primary locale for the game. The setting has an interesting mix of classic post-apocalypse and supernatural elements. Dark Earth looks distinctive, reminding me of Timothy Truman designs. While the video game scored well, it didn't do well enough to earn a PS2 port or a sequel. 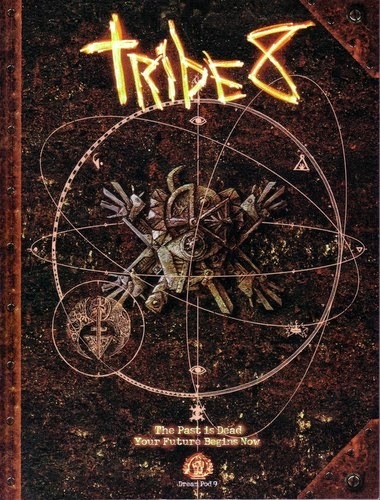 Despite that, French publisher Multisim released this tabletop rpg in parallel with the PC game. Dark Earth expands the setting and did well enough to generate a host of supplements including hefty faction sourcebooks, location books, a GM screen, and a module. Not only that, Multisim went on to release a second edition in '99 which also received five supplements. It’s amazing to see a beautiful and heavily supported line which never got any attention here in the States. Another French production. And another one with a huge backlist. In Polaris humanity has been driven underwater by a forgotten cataclysm. They've survived by a combination of technological advances and genetic manipulation. The world has divided into several powerful nation-enclaves (The Hegemony, League Red, Polar Alliance). Polaris has a harder sci-fi edge, with issues of genetic breakdown and the population decline at the forefront. It feels like a classic post-cataclysm game, with a higher surviving tech level and the added twist of an underwater civilization. The original edition had more than a dozen supplements covering everything from individual factions to pirates to the surface world. In 2008 Black Book Editions revived and revised the defunct line, simplifying the rules. They've published six supplements since then and the game appears to still be alive. A cool, far-future rpg released by Propaganda Publishing, their only publication. Thousands of years in the future players take the role of survivors on a collapsing Dyson Sphere. Genetic manipulation has produced a vast number of distinct and forgotten peoples, creating the "aliens" of the setting. After Shattered Sky the company appears to have shifted to being developers, creating Darktown: The Apocalyptic Cycle for Gold Rush in 1999. Where The Shattered Sky goes for crazy distant future sci-fi, Darktown: The Apocalyptic Cycle riffs on the World of Darkness. It offers a collapsing world caught in a conflict between science, technology, and faith. 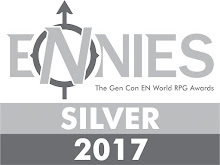 Derek Guder's RPGNet review suggests confusion about whether the game's post-apocalyptic or not, but I’ve included it for completeness. While Shattered Sky seems to have been well received, this second-product was not. The first of three GURPS post-apocalyptic supplements for this period. I considered lumping them together, but they're distinct enough to talk about alone. Reign of Steel offers a Terminator-like future. Super AI's awaken and begin to uplift others. They set up a series of global disasters, resulting in higher reliance on automation. This in turn gives the new overlords more forces and resources for their conquest. Strikingly the AI's aren't one monolithic group. Instead they're divided by philosophies and goals. The regional AIs balance their competing interests through a set of accords. That offers GM’s some variety. The world's not entirely a disaster. Different AI masters have different plans for the survivors, who they’ve organized into zones and camps. Players take the role of rebels, trying to survive in this machine-ruled apocalyptic world. They're supported by a secret organization called VIRUS, the nature of which can shape the campaign. Designer David Pulver wrote several of the crunchier GURPS sourcebooks: Bio-Tech, Ultra-Tech, Robots, Vehicles, and Mecha. This sourcebook tries to balance that with a striking background, but there's a chunk of mechanics on hand. GMs will probably need several other books to handle some of the concepts. As a nice touch, Steve Jackson Games released GURPS Reign of Steel: Will to Live which offers conversion notes for the original game to GURPS Fourth Edition as well as new material. ...was the voice screaming in the back of my head as I read through the game blurbs. 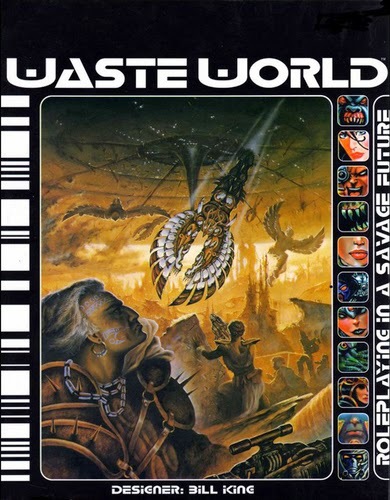 Descriptions and reviews suggest Waste World’s a combination of Heavy Metal and WH40K, set on a single war-torn world in the future. It reminds me of Mutant Chronicles, with its crazy array of character types, war as the only future, and competing national battle forces (including another Shogunate). WW’s designer Bill King worked on that game as well. Waste World also feels like a more controlled version of Rifts. It embraces a high-tech post-apocalypse where decadent and decaying technologies desperately battle it out. Cyborgs? Check. Symbiotic Armor? Check. Mecha-Ninja? Check. Despite looking like a kitchen-sink, over-the-top game, many reviews love it. In part they enjoy how much the game buys into its own craziness. But most also point out how the game replaces "c" & "ck" with "k" throughout ala Mortal Kombat. Waste World did well enough to support a starter pack, GM screen, and two substantial splat books the same year. An experimental storytelling game. In Zero players take the roles of members of a hive society who have briefly been booted from the collective consciousness. Now they want to return to independence. Rules light, it has mixed reviews. Zero seems to be post-apocalyptic by virtue of the events which led to the hive mind state. A French RPG. After a hundred years of war, the Earth's axis has shifted, melting the ice caps and flooding the world. That raises new islands, including the eponymous Atlantys. Players take the role of Atlantaen (?) citizens trying to expand the spiritual and aetheric influence of their civilization to the rest of humanity. The game has strange mix of mysticism, psychics, post-apocalypse, cyberpunk, and sci-fi (via space colonies). Reviews universally point out that the mish-mash and lack of focus undercut the game. Every blurb or summary I've read of this seems to focus on something distinct, as if they're all describing a different game. 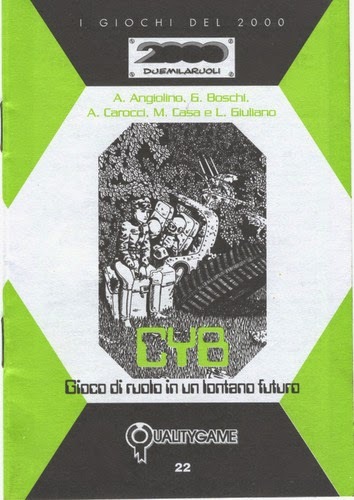 Subtitle: “Gioco di ruolo in un lontano future.” An Italian rpg, CYB has an interesting premise. Players awaken with no sense of who they are. They exit into a post-apocalyptic world overrun and dominated by plants. Eventually players learn they are cyborgs and begin to discover other secrets of the world. Originally published in Italian gaming magazine, Kappa, the reissue remains largely the same. It uses a deck of cards as a randomizer, apparently because polyhedral dice were difficult to come by. Deadlands always surprised me at the shop. It never picked up among established gamers in our area- either older grognards or college+ age AD&D or Rifts players. Instead it grabbed the attention of a large but invisible middle school/high school contingent. They came, bought the books, and headed out. Decent sales and reorders offered the only real indicator. Conversations with adults and parents years later revealed several distinct groups playing it off the store's radar. Deadlands: Hell on Earth came entirely out of the blue for me, arriving after I'd stopped working at the shop. By the time I knew about it, it had already almost hit the end of its life cycle. Because I’d never looked at it I had to try to make sense of the background for this entry. If you've read my lists, you may have seen me use the phrase "double mumbo-jumbo." This concept comes from Blake Snyder's controversial scriptwriter tools. In DMJ something presents one fantastic premise for the audience to swallow and then crams in another completely different one. Like a secret wizarding school, but some of them actually have psychic powers. Or children of the gods battling Titans, but then there's an alien invasion. It's a kitchen sink approach and can work, but it can also end up a confusing mess. 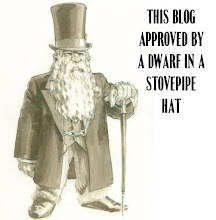 Deadlands: Hell on Earth, IMHO, goes you know what? F*** It. Let's double down on the crazy. I can't tell if that's bad or not...but I struggled to disentangle what's going on. If you know this setting , feel free to correct my summary in the comments. In the original Deadlands we have an otherworld, demonic invasion sending the planet into turmoil during the post-Civil War era. Magic, manitou, steampunk science, undead, Ghost Rock, etc., etc. Everything destroyed and changed in our history. And then (mumble, mumble, mumble) happens. Which brings us to 2074, a future world with alien encounters, space travel, and CNN. There's a big war, another apocalypse happens, society collapses. So we end up with a madcap, fallen high-tech world, with a strong Mad Max-vibe plus magic, mutants, and undead. Nuts, absolutely nuts. Reading through the history in the d20 version corebook left me confused, trying to piece together the whole picture. But at the same time my lizard brain went: this is awesome. I have to admit other kitchen-sink mash up games haven't grabbed me like this one. 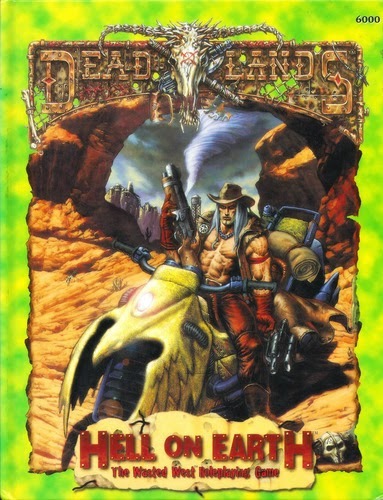 I really hope we get a Deadlands: Hell on Earth Bundle of Holding now. Hell on Earth did well enough to generate two dozen supplements, more if you count the connected Lost Colony material. It also had a short-lived d20 version that I'm guessing was a casualty of the collapse of that market. In 2012 Pinnacle released Deadlands Hell on Earth: Reloaded, but have only sporadically supported it. I'm unsure how much it keeps to the background of the original. Another blind spot for me, I only heard about Tribe 8 last year. I associate Dream Pod 9 with Heavy Gear and some sweet Cyberpunk modules. But their Tribe 8 line offers a ruined land of strange magic and scattered humanity. Our world has been destroyed by the coming of monstrous forces. How and when that happened remains shrouded in mystery. To battle back against that destruction the Goddess sent eight "Fatimas," potent avatars to rally humanity. They did so, but at a cost. While the monsters have been held back, the surviving seven Fatimas have come of organize and dominate the tribes of humanity. The PCs generally come from outside those tribes, struggling with them, the monsters, and the environment itself. There's a focus on dream magic and spirituality running through this game, set in a distant by slightly recognizable version of Canada. Dream Pod 9 strongly supported this line with books focused on the different tribes, adventures, and general setting overviews. The sourcebooks I've looked through are striking. They have a distinct and consistent art style and graphic design. The overall aesthetic's "tribal." I hesitate to use that word, but it’s built into the title. The creators have gathered together and repurposed various elements to create a new look. I'm not in the best position to judge if that's some form of cultural appropriation or more respectful re-purposing. YRMV. In 2004 DP9 released a second edition Player's Handbook which required the use of the Silhouette Roleplaying Core Rules. That moves the timeline forward fifteen years. The first edition had a heavy dose of metaplot running through it. The new version tries to work around that by revealing the whole story. This allows GM’s to reconfigure and adapt their campaigns to the material as needed. We've seen this approach with other games, like Legend of the Five Rings 4th. However, so far as I can tell, DP9 only released this book for the new edition. The line itself still seems to be in print, or at least available. Yes, we'd seen zombies used before, Rogue 417 for Fringeworthy and some parts of Rifts, plus ‘98 had the release of the small-press game, Zombi offering a Z-World. But All Flesh Must Be Eaten took the concept and ran with it. It tweaked and refined Eden's house mechanics into what would become "Unisystem" and went full-bore with the look and feel of a gory zombie flick. AFMBE offers relatively simple mechanics, with the ability to tweak crunchier elements if you want to bring those forward. 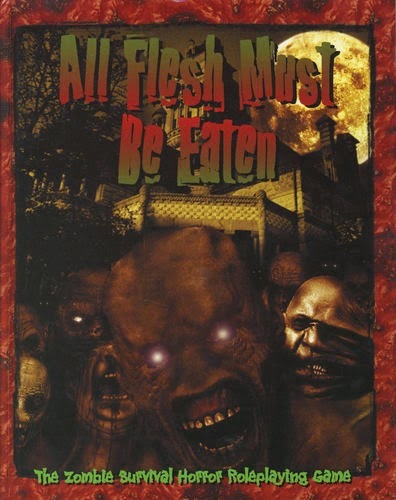 AFMBE really brought survival horror to the rpg genre, or at least put it into focus for modern games. Fantasy players had been battling back monsters for years, but Eden opened up new territory of dangerous and bloody fun. Later books would develop and refine the question of survival and how to model it at the table (One of the Living). AFMBE caught onto the rise of zombie media, perhaps even pushing it forward. In particular it branched out with a set of successful fiction anthologies, something TSR, WoTC, and WW had done. But Eden managed to garner strong mainstream attention among horror fans. AFMBE continued to expand by melding survival horror elements with other genres in "Deadworld" sourcebooks, collections of thematic campaign settings. Some of these offer genre-tinged post-apocalyptic scenarios (Fistful of Zombies, All Tomorrow's Zombies), while others simply goof on a genre (Zombie Smackdown, Enter the Zombie). AFMBE released a revised edition in 2004 and has nicely (if slowly) supported the line over the years. We'll be seeing many more zombie apocalypse games on future lists, but AFMBE remains their spiritual godfather. BTRC released two "End-of-the-World" supplements in '99, designed for CORPS but usable for any modern system. Apocalypse offers a fully-fleshed catastrophic setting. The dropping of the atomic bomb at the end of WW2 coincided with the alignment of various mystical gates and forces. "The Juxtaposition" which followed wreaked havoc across the globe. In that wake came the Earth's new overlords, the elf-like Alferi. Their various sub-races seize control of sections of the globe and brutally repress human technological development. Slide forward 50 years and add to that wandering undead, monsters, mutations, divine avatars, and dimensional oddities. Most of the book's given over to describing the background, with some material for CORPS-specific mechanics and some adventures at the end. While it has some of the kitchen-sinkness of RIFTS, Apocalypse keeps a tighter focus. On the other hand, Down in Flames embraces multiple possibilities. Like GURPS Y2K (see below), this book offers many disasters for destroying your world. The thirteen chapters include generic maps and short adventures. More aimed at pre-disaster set ups, each scenario talks briefly about how it might be executed in game. It then considers the ramifications of that event. The set-ups include classics like nuclear war and alien invasion, but also cover global madness and divine reclamation projects. My brain lumps this together with SLA Industries and A|State. Perhaps it’s the dystopian atmosphere, the infernal overtones, and the singular city. But at the same time, it associates Obsidian with other games of similar look and design- WW products, Armageddon, and a host of literally & figuratively darker games. A cover by Christopher Shy closes the deal. Overall Obsidian gives an impression of nihilism, but different from something like Kult. I don't know if that's exactly what I mean. My sense of it comes from conversations with fans of the game, rather than play experience. Obsidian takes place in the year 2299. For many reasons, Hell has cracked open and spilled onto the Earth. That has blasted and destroyed the world and overrun it with demons. The survivors managed to build a massive single city housing all of Earth's remaining population. The city itself is a Dredd MegaCity-like dystopia: stacked, packed, and crime ridden. Somehow this city possesses high technology (cybernetics, for example), but lacks science. Instead it relies on various forms of mysticism. Beyond the walls infernal forces haunt the wastelands. But they're also contacted and interacted with inside the city. So pretty much everything's dark, decaying, and despondent. I know I'm not doing justice to the material, but part of the problem lies in not having a great sense of what the players actually do. That's usually my entry point for grokking rpgs. Obsidian did well, with a striking product that small publisher Apothis Consortium got into major distribution. Part of what's interesting about this game is the diversity of opinion about it. It’s hard to get a real picture from the reviews. For example some praise the presentation while at the same time talking about how hard it can be to read. 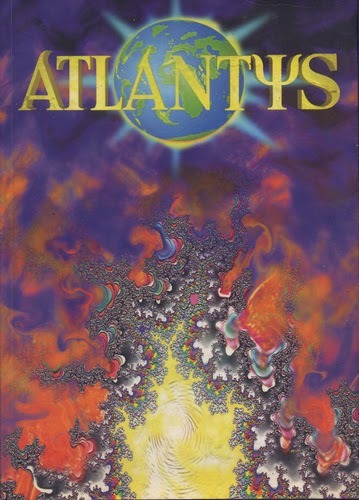 In 2001 Apothis Consortium released a revised second edition. They supported the line loosely, with four substantial setting sourcebooks. However the last of these came out in 2007. I think of Gene Wolfe's New Sun series as the archetype for the “Forgotten Earth” genre, alongside Moorcock’s Dancers at the End of Time. They’re striking and well-written books, filled with interesting world building. Yet I have to admit that I’ve only ever gotten through the first two volumes and never touched the latter material. Shadow of the Torturer and its succeeding book have an allegorical feel set in a strangely discordant world. At times it reads like Candide, at others like a grimdark version of Vance’s Dying Earth. What’s strange is that I’ve always seen these as a niche fantasy series. They’re critically respected and admired, but don’t number among the popular big quadra-tetraologies. So producing a GURPS version feels like a vanity project. GURPS New Sun aims primarily to be a sourcebook- and offers a complete history of the original series as well as the Urth of the New Sun. That means it’s spoiler heavy. The few reviews I’ve found are more than a little mixed, with even the most positive praising more the general info than the style, presentation, or playability. New Sun jams a ton of material into a single 128-page book. That’s always the challenge with these GURPS supplements. They know they likely aren’t going to get another bite at the apple, so they have to distill everything they can. Palladium has been criticized for the sprawling, power-creeping nature of some of their game lines. So it’s interesting to look at the handful of stand-alone rpgs they've crafted. 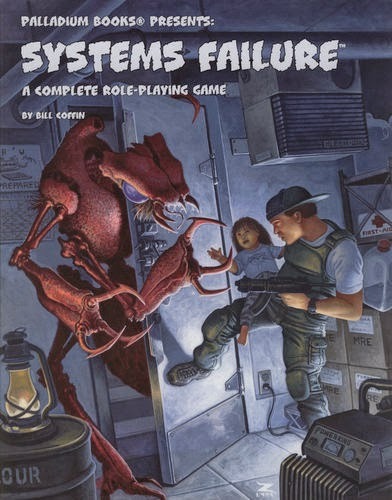 Systems Failure's one of those, developed by the excellent Bill Coffin, veteran of some of my favorite Heroes Unlimited products, like Century Station. There's more than a little joke in the premise of the game. On Dec. 31st, 1999, a bug destroys world civilization. But it isn't the Y2K bug. Instead a race of electricity consuming aliens arrive who can control any electronic device. The game takes up about a decade later with the PCs playing survivors battling against the invaders and trying to rebuild civilization. Systems Failure uses the Palladium Megaversal system as a basis. That can be off-putting for those familiar with slimmer, lighter games. It has an old-school feel in design and layout. They've crammed every page with text and concepts. The book's split roughly into three even parts: basic mechanics, character & Bug systems, and world background. There's a ton here- imagine smarter, device controlling Starship Trooper aliens versus a grab-bag resistance (feral scavengers to government psychics to genetically spliced warrior experiments). The setting material's rich and has great maps and details of occupied US. There's also a dense gear section for lovers of that kind of chrome. Systems Failure's nicely done. I'm not a big Palladium gamer, but I could easily see adapting it to another system. It's too bad Systems Failure isn't available as a pdf, but you can still find used copies pretty easily. On December 31st, 1999, my wife had to spend the whole night in an all-hands IT session, carefully babysitting systems for any sign of the end of the world. My friend John had spent the previous year making asset assessments and stickering everying as compliant. And of course the world did end and now we're in a massive holographic simulation, so you have that. GURPS Y2K, the last of our GURPS post-apoc trilogy on the list, pokes fun at the panic. It presents an anthology collection of ideas for visiting apocalypses on your world. While the book details what the Y2K bug is and the impact an absolutely improbable collapse could have had, the bulk of the volume goes through other horror scenarios- invasion, tech collapse, plague, etc. Beyond that it considers what life would be like after various situations, how society might reorganize, and what twists a GM could put on that. It even contains material on super-powered and supernatural involved disasters. It’s a nice collection, aimed at general gaming rather than GURPS-specific crunch. GMs can still purchase the pdf through Warehouse 23, though some of the elements will obviously be dated. Several other products feel borderline Post-Apocalyptic or use those elements for an existing system. For example, the fourth GURPS item for this list is GURPS Undead (1998). While it includes some discussion of zombie apocalypses, it covers Undead as a general category- from necromantic masters to wraiths to re-animations. 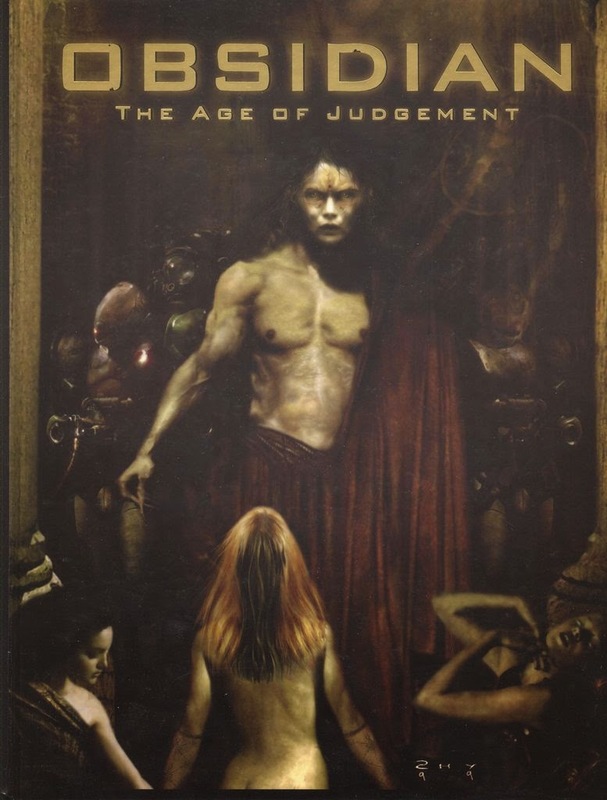 Another SJG product, Revelations V: The Final Trumpet (1998) ramps In Nomine up to Judgment Day (maybe). On the other hand, White Wolf's Ends of Empire (1999) definitively blows up that setting. It resets the Wraith: The Oblivion cosmology, and somewhat establishes the template for the company's later Time of Judgment event. 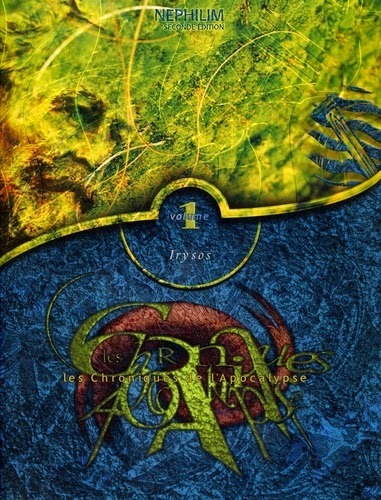 Likewise, Chroniques de l'Apocalypse I : Irysos (1999) offers of a series of adventures aimed at the end of days for Nephilim. Other games don't necessarily blow their settings up. Palladium's The Mechanoid Invasion Trilogy (1998) revisits the early colonists vs. mechanical invasion game. That's arguably a borderline apocalyptic game, with survivors from the destroyed world forced to smuggle themselves aboard the massive ships of the invaders to survive. I'm less sure about Gemini (1998), a Swedish rpg (also translated into English). It seems to be a medieval fantasy storytelling game with a strongly Judeo-Christian apocalyptic flavor. Its disaster comes in the form of a religious war which echoes those of Western history. Finally, there's the Demon City Shinjuku Role Playing Game (1999). Based on the anime movie of the same name, the apocalypse (for the moment) seems to be confined to the city of the title, at the heart of Tokyo. That's not my fav anime, so I'll reserve comment beyond that.